Three photos, ranging from 3.5 x 5 to 3.5 x 5.75 inches. Each has writing on the back in pen. Upper left: March – 1944 / Christopher – 17 months. 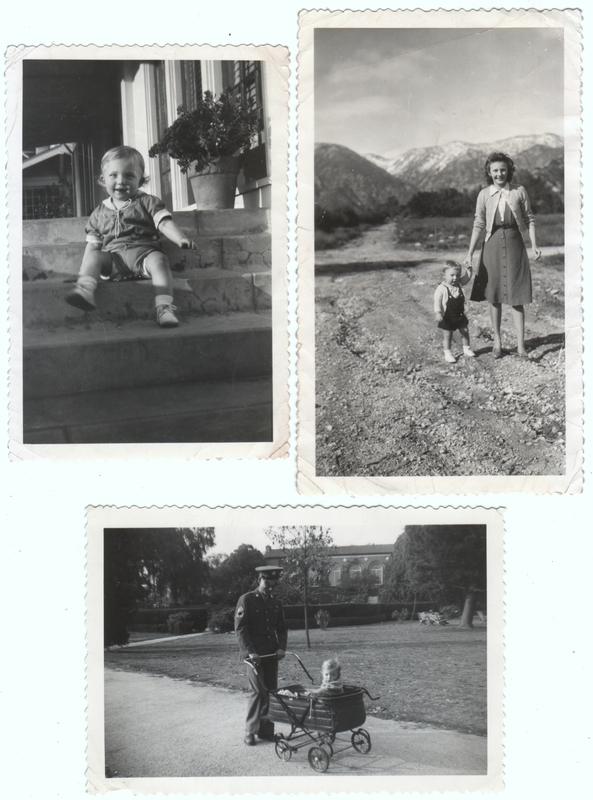 Upper right: Feb. 1944 / Chris – 16 months. Bottom: June 26, 1944. Today is the one-year anniversary of my blog! A year ago I decided to start this blog for two main reasons. First, I wanted to share my photo collection, letting these wonderful images get out in the world rather than lying stashed away in boxes. Second, I wanted to get back into the discipline of daily writing, even if it meant just a sentence or two each day. I’m thrilled with the results! As to the first reason, the reactions have been wonderful, validating my hunch that people might be interested in seeing the photos, with comments and feedback that have been gratifying and educational to me. My blog has over a hundred followers representing at least four continents, and the comments that come in from all over the world continue to astonish me and make me grateful for the powers of the internet. As for the goal of daily writing, I am pleased that I have indeed kept to my commitment, publishing a new post every single day. (I excitedly posted a few extras in the beginning, but I stuck to one a day after finally getting a follower besides my mother.) So now that my blog is entering its second year, I thought I’d post pictures of somebody going through his second year. I don’t know what’s in store down the road (who does, after all? ), but with any luck my experience with my second year will be as happy as Christopher’s seems to have been. Many thanks to everybody who has contributed thus far. I hope you’ll keep enjoying it. Matt you have an intelligent and interesting blog. Your concise and thoughtful commentary are always appreciated as is your dry wit and keen sense of exploration. Happy Blog Birthday! I look forward to your pictures and commentary each day. Thank you! I’m glad you’re still enjoying it! Very Cool Matt. I did not realize you were only doing this for a year……I guess the age of the photos don’t help me in that matter either 😉 I look forward to all the inspiring photos to come. Thanks, Charlie! Yeah, it’s funny how staring at these old photos for long enough can mess with your perspective on time. 🙂 I look forward to more of yours, too.